These Unique Football Shape Glasses add a Fun Touch to Any Event! Our Custom Imprinted 18 oz. Football Shape Glasses are made of durable clear plastic with a black base. The Football Glasses come blank or custom imprinted. Great for sporting events, parties, promotions, and much more, our Football Shape Glasses will get any crowd going. To order blank or Custom Plastic Football Shape Glasses, please call 1-800-233-0828. 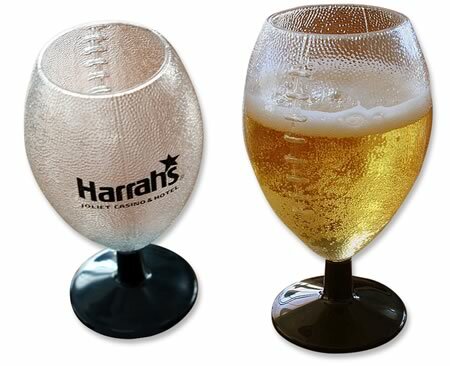 For additional information on our Custom Imprinted Football Shaped Glasses or our other Bar, Restaurant, Night Club, and Catering Supplies, please contact us at 1-800-233-0828. Feel free to browse our other Customized Bar Supplies, including Custom-Imprinted Yard Glasses, Light Up Ice Buckets.